The Sunrise has quickly become our best selling model. The pronounced "Wings" combine with a sharp tip — this versatile guitar pick will destroy your current injection-molded pick/plectrum. The added width created by the Wings provides increased grip and security when held in the playing position of your picking hand. Superior Grip From A High-Grade Transparent Thermoplastic (Polymethyl Methacrylate). 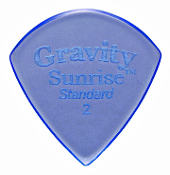 Copyright © 2014-2019 Gravity Guitar Picks UK. All rights reserved.